Aug 18, 2011 - Chief Warrant Officer Pascal Avrahami, 49, of Jerusalem was one of eight victims of a series of terrorist attacks perpetrated against civilians and IDF soldiers in Israel''s southern region. Pascal Avrahami was born in France and moved to Israel in 1977. 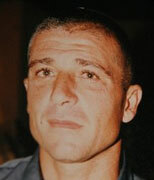 He joined the Border Police YAMAM (the Israeli SWAT Unit), in 1985 and was trained as a fighter and sniper. Avrahami was a legendary sharpshooter and was the police force''s elite anti-terror unit''s most veteran sniper. A decorated officer, Avrahami was awarded the police medal of valor in 1990 and in 1995 received the medal of distinguished service. Avrahami was killed by terrorist fire near the Egyptian border while Defense Minister Ehud Barak and IDF Chief of Staff Benny Gantz briefed journalists nearby. Shortly before he was killed, he was photographed alongside them. The announcement of Avrahami’s death was made while some of his comrades were still in the field, hunting for more terrorists. "He was a rare, exceptional man," a Border Guard official who knew Avrahami said. "He raised generations of fighters in this elite unit." Police Inspector General Yochanan Danino said: "Few knew that this modest man, who trained generations of fighters, holds two medals. He was noted for his vast professional knowledge along with his coolness and composure." Former YAMAM commander David Tsur: "He served as a model for generations of the unit''s fighters, who grew up on the stories of his bravery." Chief Warrant Officer Pascal Avrahami was buried at the Mt. Herzl cemetery in Jerusalem. He is survived by his wife Sima, and three children - Tal, 25, Matah, 20, and Ohad, 18.